This dress was made ny Emerald Key and was purchase Nove 2010. My dancer retired due to injury in 2012…I had hoped she would be able to return but cannot. 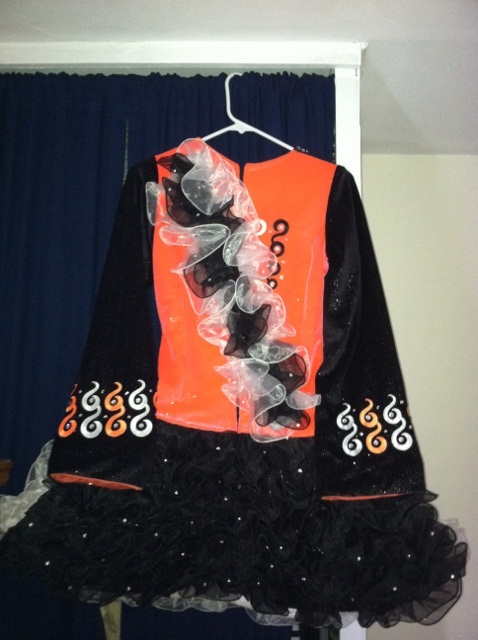 The front bodice is black and skirt white and the back bodice is orange and skirt black. The bottom is made of tulle and the shwl is made of a matching tulle fabric. 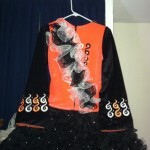 The dress includes 2 headbands one orange and one black both have rhinestones., 2 pair of bloomers one orange and one black, and shawl. Ruturns only accepted within a week of dress receipt. This dress is very light and is made of a really stretchy twinkle fabric. It has never been altered and has only had one owner. Asking Price: $US525.00. Shipping costs are not included in the asking price. Will accept returns and refund the cost of the dress, buyer to pay all shipping costs.